Psychedelic music manifests itself in strong, saturated colours — with the best psychedelia you can hear those colours, and sometimes cover art can extended that visual space even further. Think of MBV's two immortal sleeves for Isn't Anything and Loveless or the vibrant purple hues of The Associates' Sulk. It should also be asserted that psychedelia is not just guitar music (and is it only me who thinks the Flaming Lips are just bloody silly?) — remember the swathes of rave, all those anonymous junglist 12”s (as opposed to the coked-up mundanity of drum 'n' bass) and today's exhibit: the latest EP by Clark. Growls Garden is a sequence of five songs with abrasive electronic textures but layers and layers of ripe sound — an over-fertile midnight garden careering into chaos in front of your very ears, Paul Klee's Midnight Garden in aural motion. And if the forthcoming album pulls off this level of consistency, shock, energy and surprise then your mind and body are going to praise the day it was unleashed on the world. The title track and opener is very much a song, albeit a wildly mutating, distorted, tendril-snaking one. Clark sings of finding you in the garden while textures from across underground clubtronica land are thrown together in unholy matrimony. 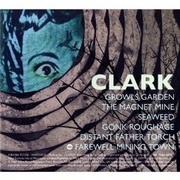 One of Clark's outstanding achievements is to pull from the muso energy of things like (ugh) drill'n'bass and all that guff but throw into something much more unique and evocative — limbs might be confused but the rhythmic chaos is a skewed paradise to marvel at. Also, he engages — there's no dumbass IDM, post-ironic, too-cool detachment. The vocals herein raise an expectation of further songs that never arrive, neatly wrong-footing the listener. 'Seaweed' rides a 4/4 over a glazed glitch snowstorm, the garden fading in and out of view until the narrative falls apart completely before reassembling itself afresh at the climax. 'Gonk Roughage' is a spastic pirouette stuffed full or rubber-band electronics ripping up frantic hip hop samples. Closer 'Farewell Mining Town' peeks through the dusk of a foggy angel chorus, a thing of straight-up beauty despite its ambiguous clarity of sound. Growl's Garden is an extraordinary EP that might pave the way for a potential album of the year — here's hoping.